With all the new and exciting digital technologies on the market, it can be easy for IT departments to forget about more established elements of their infrastructure, such as printers, multifunction printers (MFPs), and document management systems. Nevertheless, it is important that they continually evaluate all aspects of their IT environment to ensure they have the right components in place for optimal productivity and cost savings. Regarding printers and MFPs, InfoTrends research suggests that many small to medium-sized businesses (SMBs) may be underusing their print devices and placing these devices ineffectively throughout the organization. This has a number of cost and productivity implications for organizations, but can be remedied through a more balanced deployment of devices. 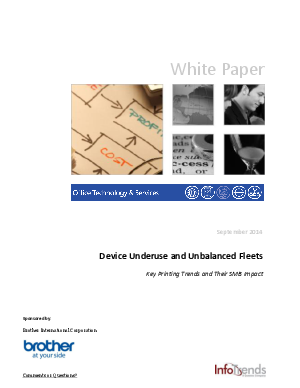 Read this white paper to learn more about key printing trends and their SMB impact.